Widely varying opportunities for employment, in a diverse range of global commodity trades, characterize the Handymax bulk carrier sector. These features have been reflected in the intense interest, shown by shipowners, in acquiring this type of vessel during the past few years. As a consequence the world Handymax fleet has grown very rapidly, by almost three fifths in deadweight capacity over the period of three years up to the end of 2012. Moreover, while the fleet enlargement pace has slackened recently, it is still quite fast and may remain brisk for some time through 2014. The employment pattern of Handymax size bulk carriers, ships of between 40,000dwt and 65,000dwt which are predominantly geared vessels with installed cranes and grabs for loading and discharging cargoes, is extremely varied. In addition to widespread use in the coal trades and grain and soya trades, and in some iron ore movements, they are used extensively in minor bulk trades including steel products, minor ores and minerals and for other industrial and agricultural commodity shipments. Strong growth in many of these trades, over recent years, and prospects for further growth have encouraged heavy investment in the sector. During the period of three years to end-2012, the Handymax fleet grew by 57% according to Clarksons figures. This expansion added almost 53 million deadweight tonnes to the end-2009 fleet, raising its capacity to over 145m dwt at the end of last year. But fleet growth is now slowing because the order book for newbuildings has diminished and much more scrapping of older tonnage has occurred. After accelerating sharply to a remarkable 19% fleet deadweight growth rate in 2010, the pace slackened to 17% in 2011 before slowing further to 12% last year. During the current year as a whole, another slowing to around 8% or under is predicted. In 2014 there are some signs that only limited further deceleration will occur, because a sizeable volume of Handymax tonnage is still on order at world shipyards. 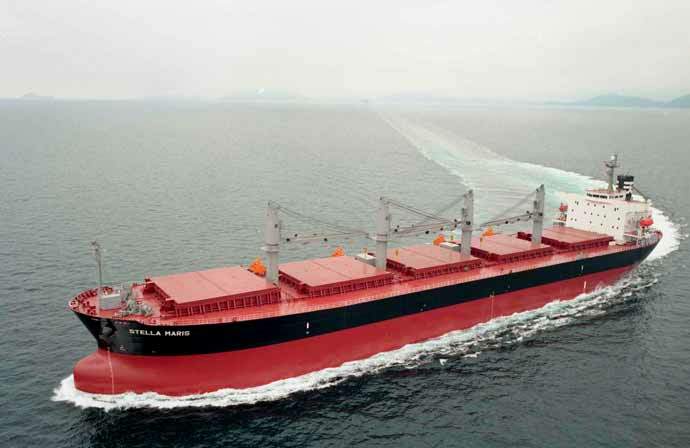 Fleet statistics, showing the position at the beginning of September 2013, reveal that the world fleet of Handymax bulk carriers consisted of 2,890 ships. With a capacity of 152.4m dwt, this sector comprised almost 22% of the entire world bulk carrier fleet. These figures emphasize the vast carrying capacity which is available. Deliveries of newbuilding Handymax vessels from world shipyards have been very heavy in the past three years, varying between 19m and 22m dwt annually. These additions have been partly offset by increasing scrapping. Sales to demolition yards were low in 2010 at just 0.4m dwt, before rising to 2.2m dwt in the following year and then more than doubling to 4.6m dwt last year. In 2013, it seems quite likely that the newbuildings total will be much lower at under 15m dwt, but the scrapping volume also seems set to decline, perhaps to around 3m dwt. The Handymax order book although reduced is currently still large, corresponding to exactly one-fifth of the existing Handymax fleet. Based on figures compiled by Clarksons, at the beginning of September this year 546 ships were on order throughout the world, with a capacity of 30.8m dwt. Many ships scheduled for delivery in the remaining months of this year probably will not be delivered until later, adding greatly to the 190 ships of 10.8m dwt already scheduled for 2014 delivery. A high proportion of Handymax newbuilding orders are within the ‘Supramax’ group, ships of 50,000dwt and larger. The popularity of this vessel size group in recent years continues, and presently 437 ships of 25.9m dwt (84% of all Handymaxes on order) are within the 50,000 to 65,000dwt category. Recently the statistical upper size limit of the Handymax bulker sector was raised to accommodate a new sub-sector of ‘ultramax’ ships, with capacity between 60,000dwt and 65,000dwt. Many more of these geared vessels will be delivered in the next few years. They are seen as having a valuable role in commodity trades requiring units with cargo handing gear and more capacity than the standard Supramax of around 52,000dwt, but less capacity than provided by the standard Panamax bulker of around 72,000dwt (which is usually a gearless vessel). Among employment sources, coal trade is prominent. In the past few years global trade in steam and coking coal has grown at varying but rapid rates, greatly benefiting Handymax ships as well as other sizes of bulk carrier. Coal forms the second largest commodity trade, only just below the largest, iron ore, and volumes are massive, reaching an estimated 1.1 billion tonnes in 2012. In the past three years global seaborne coal trade has grown at rates of 13.0% (2010), 6.5% (2011) and 9.4% (2012), and the current year’s increase is expected to be 4–5%. Much of the upwards trend in that period was attributable to extra steam coal movements for power stations and other industries, resulting in that part of the sector reaching three-quarters of the total volume. Additional exports from some countries clearly had an impact on larger size ships but, among trade routes extensively employing Supramaxes, shipments from Indonesia have been a particularly dynamic element. Indonesian coal exports reached 234mt (million tonnes) three years ago in 2009, although still well below volumes exported by the world’s largest supplier, Australia. Since then Indonesia has overtaken Australia (in 2011) to become the biggest coal supplier, with a total last year of 347mt, a cumulative increase in annual volume of 114mt over three years. A large proportion is represented by short-haul voyages to China. The 2013 total is expected to show further substantial growth, perhaps exceeding 10%. Another boost has come from Indonesia’s exports of low-quality lignite, a type of coal not normally included in international coal trade statistics. The contribution of grain (including soya) trade to Handymax employment has been more variable, both in terms of annual global volumes and geographical trading patterns. In the past twelve months up to mid-2013, trade growth ceased and weakened marginally, after an upwards trend in preceding periods. Recent weakness reflects restricted export availability after several harvest downturns in key exporting countries a year ago, consequent high international grain and soya prices, and adverse effects on import demand in many areas. World trade in wheat and coarse grains was a marginal 1% lower in crop year 2012/13 ending June, at 266mt, according to International Grains Council estimates. Global soyabeans and meal trade in marketing year 2012/13 ending September was marginally (under 1%) lower at 149.2mt, based on US Dept of Agriculture calculations. Handymax grain trade opportunities have been adversely affected by lower imports into African countries over the past twelve months, although in other importing areas such as the Middle East and European Union higher volumes were seen. Soyabeans and meal imports into the EU were lower. During the year ahead, 2013/14, a moderately positive trend is expected to resume, boosted by additional grain and soya imports into China. Minor bulk trades, some of which are actually very large and not really minor, showed substantial enlargement as a group over the past three years, benefiting Handymax employment. Annual volumes in this sector evidently grew by approximately 30% since 2009, reaching just under 1.5 billion tonnes in 2012, although that rise included a sharp rebound in 2009 from depressed levels in the previous twelve months. Steel products trade (coil, sheet, plate and other items) is a large employer of Handymax tonnage. According to seaborne steel products trade figures compiled by Clarksons, the global annual total recovered rapidly after the severe setback in 2009, since when it has expanded by 32% to reach an estimated 279mt in 2012. Another rise of about 3% could be seen this year. The steel trade is characterized by an extremely complex geographical trading pattern, with many countries being simultaneously both substantial exporters and large importers, reflecting the enormous variety of finished steel products grades available. Last year China exported 55mt and imported 14mt. South Korea exported 30mt and imported 20mt. The EU exported (to countries outside the area) 38mt and imported 25mt. These World Steel Association figures emphasize how two-way flows generate massive demand for Handymax and other bulk carriers. At the end of September this year and early part of October, the Handymax freight market strengthened. The Baltic Supramax Index (based on timecharter trip rates for a standard 52,000dwt-size bulk carrier with cranes and grabs) abruptly jumped by 20% to around 1,200, after remaining in a 850-1,000 range for about six months. How sustainable this upturn will prove is unclear. There is still great over-capacity of ships in the global freight market as a whole, affecting the Handymax sector. Much of the excess has been absorbed by vessel productivity deterioration manifested in slow-steaming and other trading ‘inefficiencies’. Global seaborne trade expansion and demand for tonnage has been growing at a healthy pace in the past few years and that trend is continuing. But the supply of transport capacity in the fleet has exceeded, sometimes greatly exceeded increasing requirements, leading to a subdued dry bulk freight market.